Maine lighthouses were the difference between life and death for thousands of sailors in the past. The rugged coast that people come from all over the world to experience once claimed countless ships and lives before towers like the one on Boon Island rose up on the rocky shores to protect those at sea. Navigating slowly through a thick fog, a ship could sometimes only be guided by the sound of the bell or foghorn. For a more than a century, the keepers and their families lived under sometimes unimaginable conditions to keep their beacons lit. Later in their history, many places like Whaleback served America in WWII as lookout posts against the German U-boats that were active in New England waters. Today, in our world of GPS and radar, you could try to make a case that these sentinels are no longer needed. Certainly they aren't manned anymore, and their great lights and horns are all automated now. 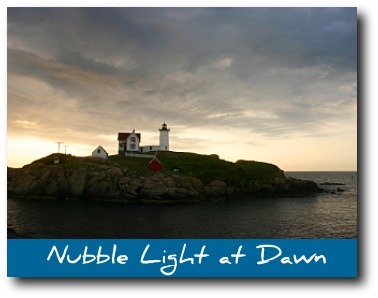 But when I'm outside on a foggy night and hear the Nubble foghorn, I know just where I am in the world. I'm home. And I feel comforted just knowing that it's out there in the dark, keeping its watch. Often, visitors to the area want to take a closer look at our lighthouses, to learn more about their history and their legends. 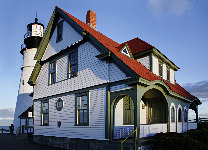 For those people, there are some exceptional choices to tour the southern lighthouses of Maine. When I was a child in Massachusetts, I was fortunate enough to take a tour in Boston Harbor with the incomparable Edward Rowe Snow, and I remember well sitting at his feet in the boat, thrilled with the stories he was telling about the harbor and its' islands. Mr. Snow was a major chronicler of New England maritime history. He was famous as a historian of the New England coast and also as a popular storyteller, lecturer, preservationist, and treasure hunter. When it came to New England coastal history, Edward Rowe Snow was the man. He knew everything. Lighthouse lovers visiting our area are extremely fortunate to have access to a similar expert who is passing on his knowledge of lighthouses to the public. Jeremy D'Entremont has been called the leading expert on New England's lighthouses. He's been photographing and writing about lighthouses for about 25 years. Jeremy is the founder of the Friends of Portsmouth Harbor Lighthouses, and the president of the American Lighthouse Foundation. He has lectured on his favorite topic all along the New England coast. His all-day van tour of southern Maine lighthouses begins and ends in Portsmouth, New Hampshire, about 20 minutes from York, Maine. Portland area lighthouses on the tour include Maine's oldest, the 1791 Portland Head Light, Spring Point Ledge Light, Cape Elizabeth Light, Portland Breakwater Light. A waterfront lunch is included at the Spring Point Marina. Returning south from Portland, this tour makes a stop at the Lighthouse Depot in Wells for a uniquely Maine shopping experience, then continues on to explore Nubble Lighthouse in York before returning to tour the inside of Portsmouth Harbor Lighthouse in New Castle, New Hampshire. Below is a wonderful 7 minute video from New Hampshire Chronicle that features both Jeremy and the Portsmouth Harbor Lighthouse. There's even a few lighthouse ghost stories towards the end, too! You can also opt for the tour that stops at L.L. Bean in Freeport Maine for an hour and a half of shopping, Pemaquid Point Lighthouse, Doubling Point lighthouse on the Kennebec river, and finally the Portsmouth Harbor lighthouse. 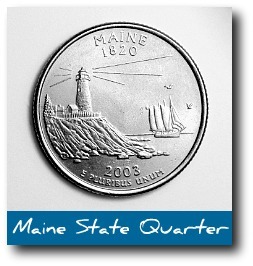 No time for an all day tour of Maine lighthouses? No problem!